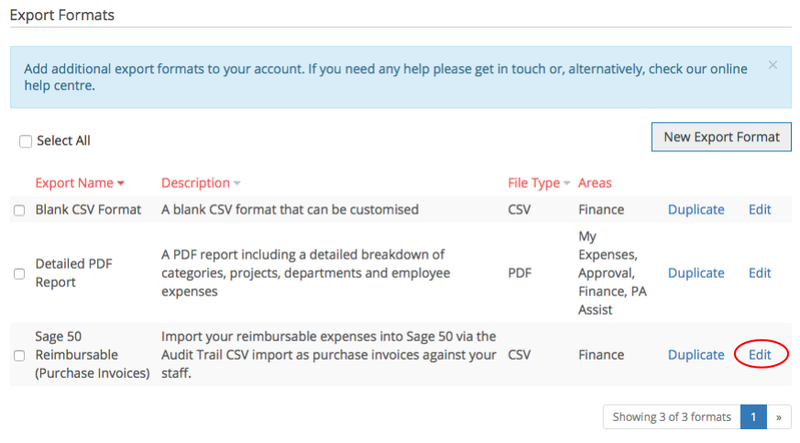 If you want to import your expenses into your Xero account, we already have a Xero CSV export format available. ExpenseIn uses a powerful CSV building tool that can be easily customised so that data from ExpenseIn can be exported directly into Xero with the simple upload of a CSV file. We recommend that you have a look at the Xero Import Documentation to ensure you understand how the import works. Before you add your Xero export formats to your account, you will want to match the references you have within your Xero package to the ones in your ExpenseIn account. This will allow the data to pull through correctly. Navigate to Admin and click on Categories. Click Edit next to the category and input the reference that matches your Chart of Accounts in Xero. Check out our Categories help article for more information on category configuration. Navigate to Users in Admin. If you’ve set up your users up as suppliers in Xero you will need to Edit each user and input the matching Supplier Name from Xero as the Reference number. Navigate to VAT rates in Admin. The Tax Name in Xero will need to match the VAT Reference in ExpenseIn. For example, if the 20% rate is called 20% (VAT on Expenses) this will need to be inputted as the reference. Navigate to Departments in Admin. If you are recording Departments in Xero, you should use the same tracking name for these in ExpenseIn. Navigate to Projects in Admin. If you are recording Projects in Xero, you should use the same tracking name for these in ExpenseIn. 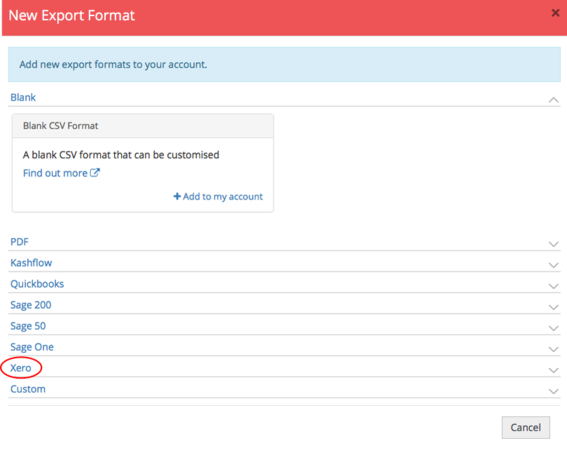 Now that everything has been set up in the Admin area, you can now add the Xero CSV export format to your account. In the Admin area, click Export Formats. 3. Click the Xero dropdown. 4. Depending on whether you have out of pocket expenses and/or company card expenses, you can add the appropriate format to your account. Click Edit if you want to view the mappings between the ExpenseIn fields and Xero. We automatically use the names of the columns that Xero requires so that the import process is as easy as possible. Please note: Reimbursable expenses are grouped by submission so an invoice will be created per supplier per submission/claim. If you wish to create negative expenses on your account, check out our Advanced Settings article. If you are using Company Cards and you have set up the references as detailed before, you will be almost ready to go after you input the name in Xero for your card account in the Contact Name > Field Options box on the far right side. Please note: Company Card expenses are not grouped in Xero. Now that your account has been mapped to reflect your Xero package and the CSV export format has been added, you can now export your expenses using this format in the Finance area. Check out our Export expenses to CSV help article.